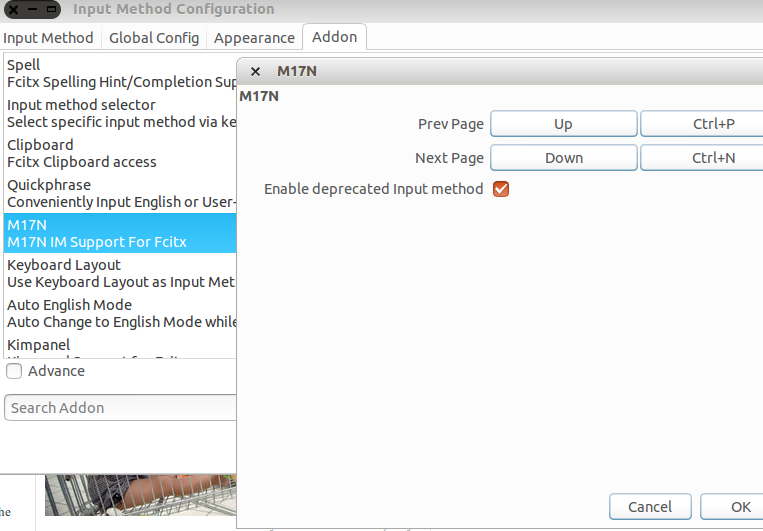 Open fcitx Configuration, under "addon," choose "Enable deprecated input method." Choose IAST (m17n) Sanskrit keyboard under fcitx configuration. Select IAST (m17n), under Language "Sanskrit" in Fcitx Configuration. #1Submitted by Anonymous on Sun, 2013-03-31 22:52. I have one problem though. The '.t' diacritic always shows up under the letter before the 't'. Is there a workaround? #2Submitted by Anonymous on Mon, 2013-04-01 04:29. Sanskrit IAST （m17n）works without problem for me. It also works great in Ubuntu 12.04. #3Submitted by Anonymous on Mon, 2013-04-01 16:53. I see. I've played with it a bit and I've noticed it's only in LibreOffice. In other input windows it looks fine. I'm on Linux Mint 14, using LibreOffice 4.0. #4Submitted by faqing on Mon, 2013-04-01 19:24. I think, it is the problem of your iBus setting. Go to IBus Preferences, under "Advanced", un-select "Share the same input method among all applications." #5Submitted by Anonymous on Tue, 2013-04-02 01:09. I've tried selected and un-selected and they are still misaligned. Some of other letter's diacritics are a bit misaligned also but no as much as .t. Maybe it has something to do with the combination of IBus with LibreOffice 4.0. Any way, thanks for the suggestion! #6Submitted by Anonymous on Wed, 2010-11-03 07:27.
however i could not type in Kile, when i type it shows the devanagari letters and as soon as I press space bar to type next work previous word gets erased. its really frustrating to do that, for now the work around is that I type in office and later paste it in kile. #7Submitted by faqing on Fri, 2010-11-12 10:39. #8Submitted by Anonymous on Fri, 2010-03-12 00:38. Hi, thank you so much for this! I use Debian Lenny. I downloaded and installed 'scim-m17n' but unfortunately, for some reason, in my '/usr/share/m17n' directory there's no such file as: 'sa-translit.mim'. So I still can't type in Pali. Does anyone know how I could solve this problem? #9Submitted by Anonymous on Sat, 2010-03-13 16:49. You need to create the file. #10Submitted by Anonymous on Tue, 2010-07-27 22:18. Hello there! It's been a while since my last post. I'd given up typing in Pali, but now I'm back again. Sorry, friend, only now did I get the idea! I have to create the file! I'd never done that before. Thanks for that! However, when I pasted the content of the new file in the terminal, some characters (all characters containing a dot) didn't appear. They appeared only as those little "squares" (unrecognized characters). I suppose that's ok, though. It's probably happening only at the terminal. Step 3 ["Your new transliteration input method (t-sa-translit) should be available under the "Other" category"] is also fine here. Anyway, I still can't type in Pali, unfortunately. Can anyone help me try to understand what it is that I'm missing, please? #11Submitted by Anonymous on Thu, 2010-07-29 12:48. #12Submitted by Anonymous on Sat, 2010-07-31 05:01. It finally works. I followed the instructions at the link you provided me above, and that was it. Thank VERY VERY much for your help!